LONDON, United KingdomA trio of HARMAN Soundcraft Vi consoles created a unique workflow recently when one of the legends of the Disco era, Nile Rodgers, performed with his 9-piece band in a special one-off concert at London's IndigO2, performing under the name "Chic featuring Nile Rodgers." Production manager/FOH sound engineer John Ryan and monitor engineer Marco Dellatorre, who have worked together with the artist for ten years, were pleased to be onboard the house's two installed Vi6 digital consoles, while Eduardo Puhl, a house engineer at another premier London venue where Vi's are installed (Koko in Camden Town) brought his Vi1 (and Vi Compact stage rack) to handle the broadcast and recording feed. The show was streamed live via Living Indie, enabling thousands of fans to watch it online. All three sound engineers bring enormous digital mixing experience and favored the idea of using the house consoles. Of the broadcast and recording element Puhl — a resident sound engineer at Koko since 2010 — explained, "We took analogue splits from the other desk channels into the stage rack down, running optical fiber to the Vi1 which was located in a production unit just outside the venue." Aside from dealing with the broadcast mix he also recorded the show as a back up, using the redundant port on the Vi1 MADI card to output to a MADI sound interface, and into a laptop running Reaper DAW software. Meanwhile, at FOH, John Ryan said he was always happy to use the Vi6 mixer, and received great support from house engineer, Matt Valentine. "We generally use locally supplied equipment, and always ask for mixers of our preference, such as the Vi6. The workflow was flawless and the local audio crew, with whom we had worked before, was extremely professional, helping us to deliver a great show." 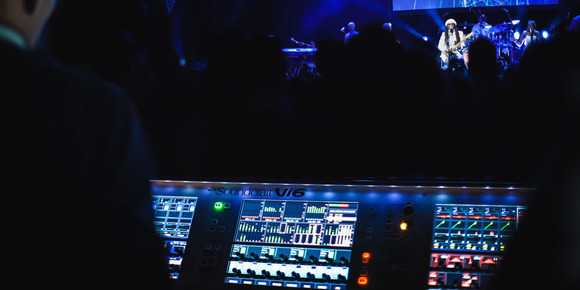 Digital mixers such as the Vi6 are a perfect solution: "As we are often tight on time, we travel with a series of show files. We loaded a previously saved file from a show in France and Matt arranged the layers the way I needed them, and within a few minutes we were ready for soundcheck. "Ease of navigation on the Vi6 was just a matter of getting used to where things were on the surface." John Ryan says he always uses onboard dynamics but Rodgers' band requires little in the way of processing. "What you hear is what the band is playing…no clicks, sequencers and recorded tracks, and Nile only requires limited compression on his vocal. I consider myself lucky to be working with a band that is aware of the source they are feeding us, most of them being record producers, as well as incredible professionals, so our job is only to assemble the puzzle, and no magic is required." Marco Dellatorre has been using the Vi6 since it was launched back in 2008 when he was introduced to it "for a long and complex tour" by Italian distributor Marco Porro at Leading Technologies. "I was immediately impressed with the sound and its features have come a long way since then." The length of the tour gave him a chance to thoroughly evaluate the desk and provide feedback, with many of his suggestions subsequently adopted. At IndigO2, Marco ran 24 outputs from the monitor desk, with parametric EQ on all IEM and graphic EQ on all wedges, with no gates or compressors (and snapshot on Let's Dance). "I use the desk's preview feature during the show because I need to create a second snapshot for Let's Dance. On that song there are a lot of changes and even if I can create this snapshot during sound check, I prefer to create it on the fly because my mix approach is live and I follow the band mood every gig," he explains. He also praised the house support team. "They set all my outs and ins the way I would normally use them, prior to arrival, it was very fast and professional." In summary Eduardo Puhl said he had certainly been impressed with the show. "This was a fantastic experience — everything worked and that's what you need in such a busy gig. "Being able to have a stage box on stage that doesn't occupy much space and having remote gain control over all channels is great. The Vis are fast desks to work with … everything is laid out in front of you and is easy to visualize when things are engaged, and that's great too. "One more fantastic feature was the use of matrixes alongside the Monitor section, so I could route and switch with a click the source of the Directors reference speakers, by using the Users feature on the Monitor section." The sell-out show itself was organized to celebrate the partnership with O2 and Bauer Media's work experience initiative GoThinkBig.